Howell, K.L., Embling, C., Holt, R., Stewart, H.A. (2011) Using predictive modelling to map the distribution of selected habitats listed as MPA search features in Scottish waters. Joint Nature Conservation Committee Report. Unpublished. 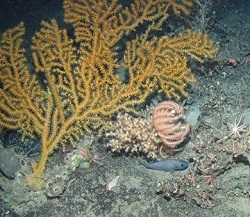 Long, D., Howell, K.L., Davies, J., Stewart, H. (2010) JNCC Offshore Natura survey of Anton Dohrn Seamount and East Rockall Bank Areas of Search. Joint Nature Conservation Committee Report 437, 132p.